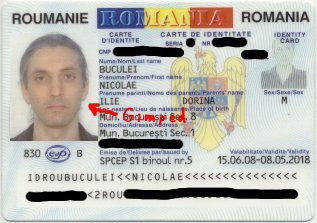 I could rant about a "John Doe" life: over a year of not having a valid ID card, living an almost underground life, mostly normal but with only a few minor annoyances (like having the bank accounts blocked, being unable to travel outside of the country or, if that matters, being unable to vote - it doesn't matter, we can't escape the communist mafia). I could write, for those who know me closely and may jump to some wrong conclusions, about my beard: even if it is not visible, I still have a beard inside, nothing changed, I am the same. Instead my choice was to write about photo framing, this may be useful for a wider audience. So I took the plunge, temporarily shaved my beard and renewed my ID card (it expired over one year ago and I have not cared enough to replace it). I used the opportunity of the local elections around here, when the people at the office in charge work overtime, so I had my card ready in two days, instead of the usual wait (at least a week, I believe). In unrelated news, do you know Adrian Joian, a Fedora Ambassador and my colleague from the Romanian Fedora community? Today he had the last exam for his university degree and finished with a perfect 10. That's a strange thing. In many countries you must provide a picture that shows quite exactly what your mockup's picture shows. Pictures like the one that is on your actual ID-card are not accepted. That's true for ID-cards, passports and visas. I know this fact to be true for Swiss ID-cards/passports and for the US-visa. Well, the photo was made by the card issuer, I believe it was a combination of stupidity, indolence and laziness.